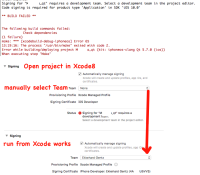 Signing for "xxxxx" requires a development team. Select a development team in the project editor. My project can only be compiled using Xcode. With Xcode 7.3 there is no problem and my provisioning profiles are all set up correctly. I tried to set up the code signing identity via Xcode and then recompiling with QtCreator but it seems to overwrite the setting and reproduces the same error. This is really important to fix since I can no longer use QtCreator to develop on iOS!